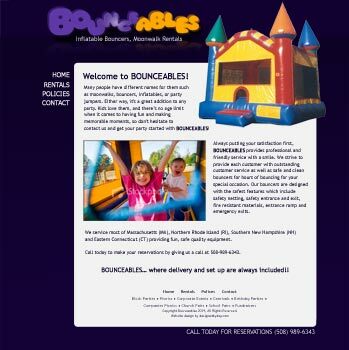 Bounceables Ma is a bouncer & moonwalk rental business operating in the Merrimack Valley and southern NH area. Sean Dever, the owner, wanted a simple, squishy fun website that customers could quickly navigate while children were entertained and excited. Additional domain names have been purchased including moonwalksandbouncersforrent.com, helping in target keywords. Sean's service is amazing! For my son's birthday we rented a giant water slide, which Sean delivered, setup and then came back to take down, pack up and leave with. I've never seen such amazing service with bouncable inflatables.